The latest addition to our best-selling ZERØGRAND series is the ZERØGRAND Hiker Boot. Crafted in waterproof nubuck and featuring our Grand.ØS technology for superior comfort, we love wearing this retro hiker-inspired style with contrasting-color layers for a chic outdoor look. 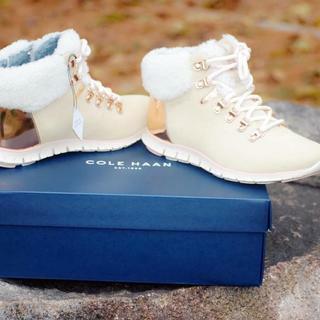 Waterproof nubuck upper with shearling collar and lace detail. Lightweight EVA midsole with rubber outsole and concealed Grand.ØS technology for ultimate comfort. Super comfy, true to size, and they are sooo cute. They are comfortable and stylish. I have several pair in different colors. Love these hikers. Are these boots snow boots? BEST ANSWER: I wear them in snowy weather and they are water proof, so they are fine if you walk through some snow. If it is heavy, deep snow, they probably aren't the boot to have. If you don't want a snow boot, but just a regular boot, these fit the bill there too. I LOVE mine and they keep my feet incredibly comfortable throughout a north east winter.